A well-respected journalist offers evidence, both empirical and anecdotal, about the therapeutic benefits of psychedelic drugs. The late comedian Bill Hicks, prone to taking what psychedelic bard Terence McKenna called “heroic doses” of mushrooms, used to refer to the use of drugs as “squeegeeing open your third eye.” In this cleareyed account, former Washington Post Magazine editor Shroder (Old Souls: The Scientific Evidence For Past Lives, 1999, etc.) explores both the complex history of the issue and the current thinking on the use of LSD, Ecstasy and other psychotropic substances for healing troubled minds. 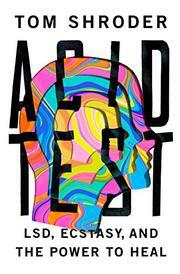 Thankfully, the author only briefly touches on the usual tropes—there’s a thoughtful chapter on Aldous Huxley’s introduction to LSD, after which he wrote, “To fathom Hell or soar angelic, Just take a pinch of psychedelic”—but Shroder skims over old stories about Ken Kesey, Owsley Stanley and Timothy Leary that have plagued authentic researchers for years. Instead, the author tells his complex story via three men: Rick Doblin, the founder of the Multidisciplinary Association for Psychedelic Studies; Michael Mithoefer, a former emergency room doctor whose interest in exploring his own mind led him to become a trauma psychologist; and Nick Blackston, a U.S. Marine whose war experiences are characteristic of the waves of soldiers returning from war with catastrophic PTSD. Occasionally, the stories are amusing: At one point, Doblin was being considered for an internship at the Food and Drug Administration. Upon being turned down, he thought, “Now I can still smoke pot and don’t have to wear a suit.” More often, they’re moving—e.g., Mithoefer’s assistance with a variety of patients, many of whom spoke on the record about their experiences, to discover what the doctor calls “inner healing intelligence.” Add to these stories a perceptive criticism of the failings of America’s war on drugs, and Shroder delivers an important historical perspective on a highly controversial issue in modern medicine. An observant argument for understanding a society through the drugs it uses.